I have a little confession - accessories are my weakness. Shocking, I know. There’s just something about a great handbag or a pair of shoes that speak to me. Unfortunately for my wallet (and husband’s sanity) accessories can get expensive rather quickly, so in order to make certain pricier pieces work within our budget I’ve learned to mix higher quality items with budget buys. The best part of mixing high and low is that if you pick your budget items well, no one will be able to tell exactly how much you spent (or saved!) on that piece. The number one thing when looking for your “low” items is to read the size and material description when shopping online! I can’t tell you how many times I’ve looked at an item and thought how perfect it was until I read the measurements and realized that it would definitely be a crop top on me. I know I have a long torso and how things hang on a model aren’t how they’re going to hang on me. Although I don’t usually think it’s as important as sizing information, what the item is made out of will sometimes make me steer clear of it altogether. It’s more of a personal preference, but I just thought it was worth mentioning! Right after I look at the sizing information, I check to see if there are any reviews and/or customer photos. I take most of them with a grain of salt knowing that people who review are either really happy with the item or they hate it, but the middle of the road (3 and 4 stars) are usually the reviews I focus on. I also love the reviews people leave after they launder the item so you can find out if it shrinks or pills or loses it’s shape! I rarely pay full price for something unless it is one of my splurge items I’ve wanted for a while because it never ceases to amaze me how quickly things go on sale. Be persistent and check sites frequently because these days it seems like at least one retailer is having a sale or has marked down items towards the end of the season. A lot of stores are starting to price match more frequently, so even if you can’t find the size or color of an item you wanted at one retailer you can always see if the place that does have the item will match the price! 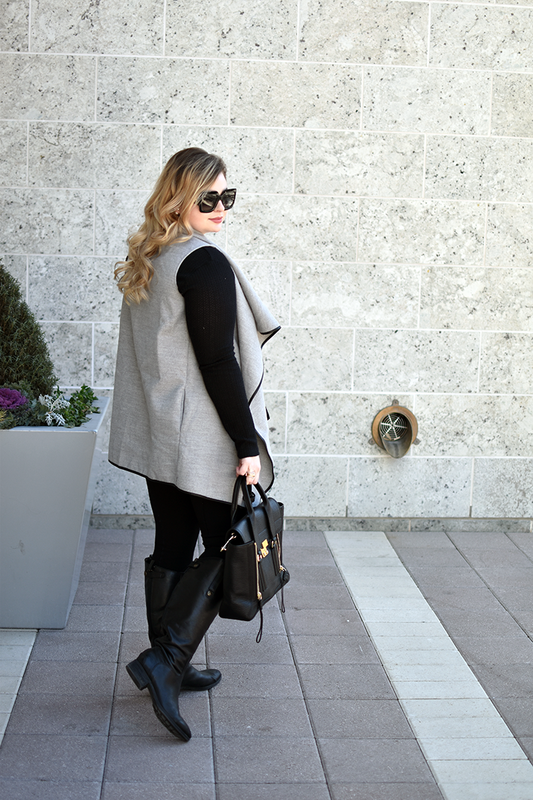 Now that I’ve shared a few of my tips, let’s talk about the outfit in this post! 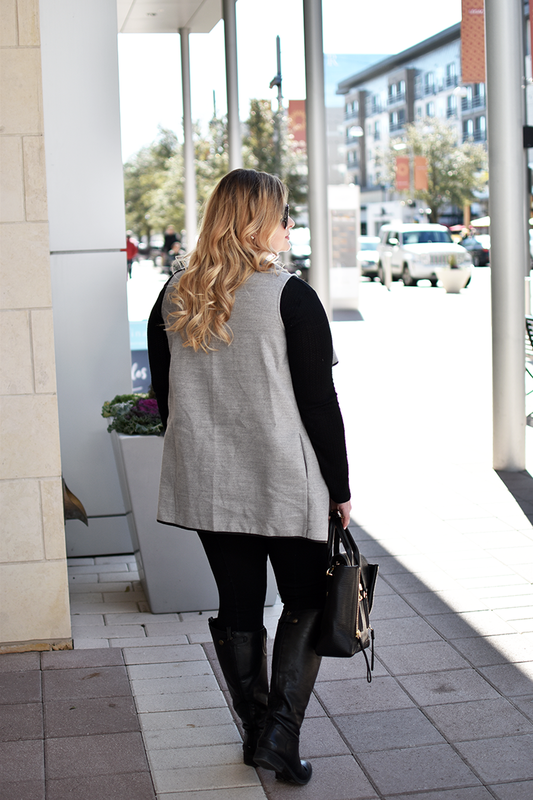 The vest - which has quickly become a favorite - is my biggest budget item coming in just under $25. What drew me to this vest is the contrast detail around the edge that really makes a statement and instantly makes it look like a higher end piece. 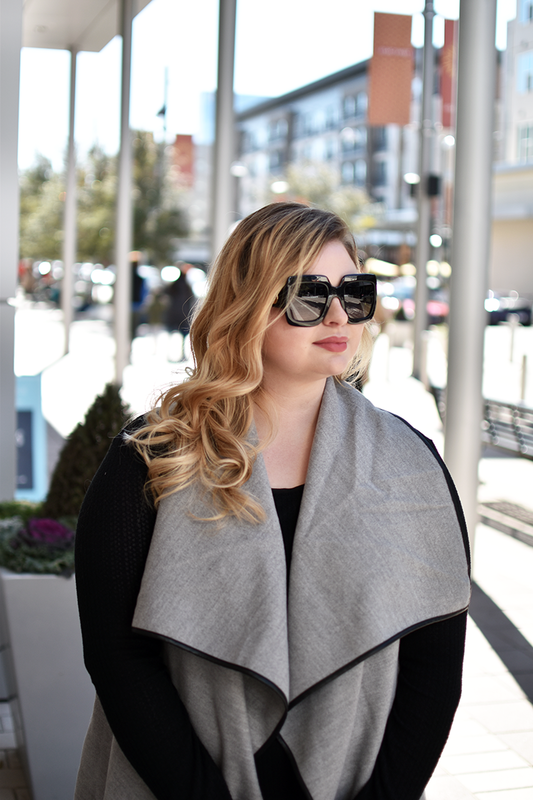 My splurge pieces from this outfit are my purse and sunglasses, both of which are classic items will last me years to come!